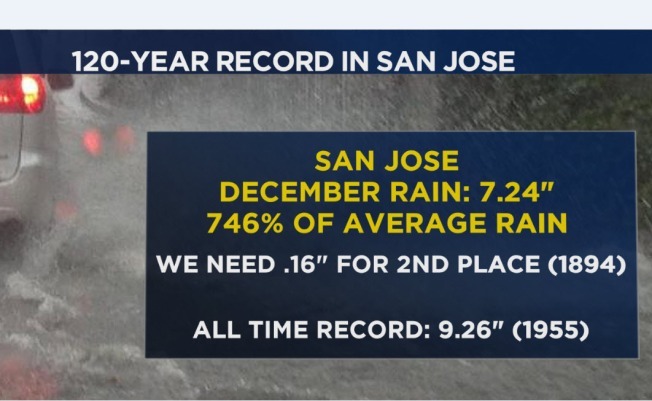 This is now the third wettest December for San Jose. If the city, specifically at the San Jose International Airport, receives .16 inches of rain by December's end, then the rainfall will beat a record for the second wettest winter set in 1894 when the same spot received 7.4 inches of rain. As of early Wednesday morning, San Jose had seen 7.24 inches of rain. And meteorologist Christina Loren predicted the record for No. 2 would be reached by 4 p.m. Still, the wettest winter on record in San Jose was set in 1955, when the area near the airport saw 9.26 inches, according to the National Weather Service. So far in San Jose, the city is already at 746 percent of what it normally averages in a typical December, according to National Weather Service data culled over the last 120 years. CORRECTION: An earlier version of this story stated that the wetted record in San Jose was set in 1894.